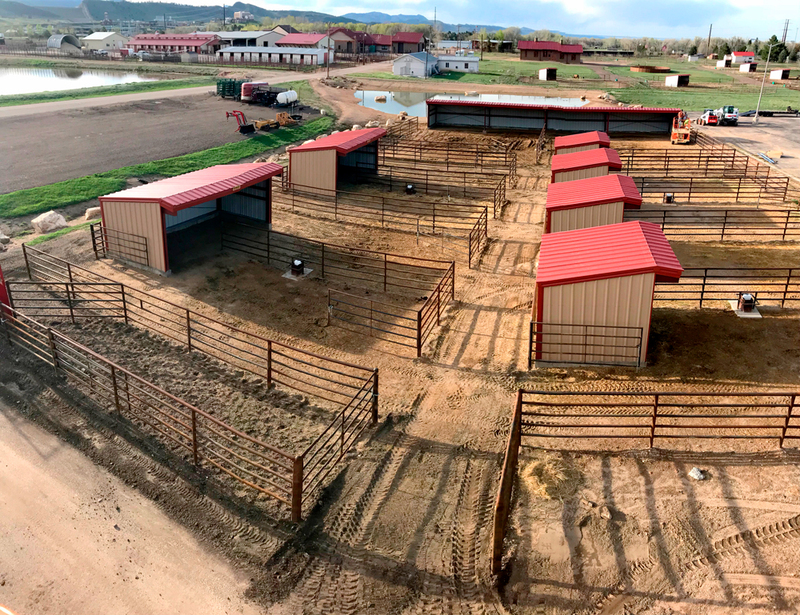 Sunward Steel Buildings is honored to have partnered with Colorado State University in Fort Collins, Colorado, on the design and creation of the university’s new outdoor horse shelters. Working in conjunction with Dr. Jerry Black, the director of the school’s Equine Sciences program, and other department staff members, Sunward created and delivered functional, efficient equine shelters that optimize animal safety. Recognized worldwide for its efforts to improve standards with regard for equine education, animal care and training, CSU’s Equine Sciences program and campus host numerous industry events each year, among them the prestigious Legends of Ranching Horse Sale. The six new steel shelters offer shade and structurally sound protection for horses featured during these and other exhibitions and competitions, and they all share a matching color scheme, boasting striking, Sahara Tan exteriors and Rustic Red roofs and trim. The first and largest of the six buildings stands 12’x96’ x 8’-6”/10’-6” in size, while the second metal horse shelter stands 12’x24’ x 8’-6”/10’-6”. The remaining four equine shelters stand 10’x12’ x 8’-10”/10’-6” upon erection, while all six buildings feature durable, corrosion-resistant single-slope roofs with 2:12 pitches overhead. Offering reliability, adaptability and uncompromising durability, steel buildings are a top choice among those looking to fulfill equine housing, feed storage and recreational needs. Sunward Steel is proud to have played a role in enhancing CSU’s Equine Sciences campus while improving the safety of its animals. Set within historic, scenic Fort Collins in northern Colorado, Colorado State University is a public research institution with more than 33,000 students. The city of Fort Collins sits within north-central Colorado’s Larimer County, about 65 miles north of Denver and about 30 miles outside Greeley. Considering purchasing a metal building for use in Colorado? Click here for a price quote.